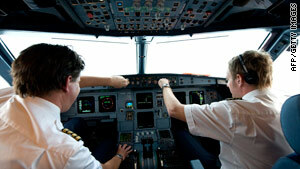 Federal Flight Deck Officers are commercial pilots who volunteer to undergo training to carry weapons aboard flights. Washington (CNN) -- The Department of Homeland Security on Thursday extended permission for hundreds of pilots to carry firearms -- just hours before their certification to carry the weapons was to expire, according to an organization which represents the pilots. "A few hundred" Federal Flight Deck Officers -- or FFDOs -- were to lose their certification to carry firearms effective midnight on New Year's Eve, said Mike Karn, executive vice president of the Federal Flight Deck Officer Association. The loss would have come at a time of heightened concern about air security because of the attempted bombing of Northwest Flight 253 on Christmas Day. But Karn said the DHS's Federal Air Marshal program notified him Thursday afternoon that the pilots' certification would be extended. A Transportation Security Administration official confirmed that certifications had been extended for six months "in light of recent events." The official said that "due to an internal miscommunication, scheduled notifications to these officers were prematurely issued," but he offered no further explanation. FFDOs are commercial pilots who volunteer to undergo training so they can carry weapons to protect their aircraft. They undergo initial training at federal law enforcement training academies and must re-qualify with firearms every six months, and undergo a two-day recurrent training every three to five years. "I'm grateful [for the extension] because that will keep the most cost-effective last line of defense [of aircraft] in place," Karn said. "But I'm still concerned that such a limited budget has been approved for this program, and volunteers who want to protect the American public will be turned away." Karn said the budget for the program has not increased since 2003, effectively capping the number of armed pilots. The exact number of FFDOs is classified, but government officials have said in the past the number greatly exceeds the number of federal air marshals -- plain-clothed officers who fly in the cabin of the plane to protect aircraft. Several FFDOs contacted by CNN said DHS has made getting recurrent training onerous for pilots, limiting the number and sizes of classes. Pilots also must pay for their own hotels and food during training -- "our own time and our own dime," said one pilot -- placing a further burden on them. Had the loss of certification occurred, it would not have affected the pilots' flight clearance, only their ability to carry weapons. Opinion: Is aviation security mostly for show?